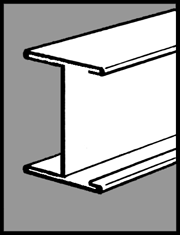 A rolled-steel member with an H-shaped cross section with parallel flanges and faces; used for structural columns and piles, due to its ability to withstand rotation; usually square in its outer dimensions. The maximum diagonal dimension of the H-section in Table 2, including shear studs, is 669 mm because headed studs are typically welded to an H-shaped column in a workshop and then delivered to the field. 25 Design load per column (kN) 6,811 Design compressive H-section 7,238 strength (kN) CCFT 8,167 Excavation plan B * Fifth and Sixth basement floors Final excavation part * Pile cap * Additional excavation of 1 m for the construction of a pile cap Exposed length of a column (m) 11. The "stable" outlook mirrors Fitch's projection that the company's solid market standing in the H-section products and constant optimisation of its product mix offsets the risk stemming from the intensely competitive Chinese steel market, the agency said. Making stained glass involves using coloured glass and lead-came (the H-section that holds glass pieces in position). I believe with ArcelorMittal's support in steel production technology, its network of worldwide raw material sourcing and financial management expertise, China Oriental can expedite its development and the realization of its plan to become a world-class leading H-section steel production base in the PRC," said Mr.
To diversify the iron and steel product mix and achieve business integration, China Oriental is also engaged in the production of other downstream products such as cold rolled sheets, galvanised sheets and H-section steel. Through expanding its production capacity to over 10 million tonnes per year (mtpa), it is now being recognised as a tier-1 steel producer in Hebei province and a leading H-section steel producer," Lim added. Fitch rates China Oriental at BB+, outlook "stable"